Expectations understandably aren't high when looking for a cheap 5 string bass under the $300 mark. It's easy to get suckered into a false economy when you're on a budget. So, after considerable research, we've found four 5-string basses that consistently exceed expectations for this price range. All the picks below offer unique sounds and finishes. But more importantly, all offer the quality build and tone that you'd expect to find on much more expensive models. Don't forget to also check out our featured 4-string bass guitars. Summary Ideal for beginners or those who want a reliable, well rounded 5-string bass for home recording and practice. Active Phat II boost, fast GSR5 neck, especially deep lows with a subtle growl. Classic Jazz Bass spec and sound. Round and smooth tone with strong mid-range definition. Active boost. Slim neck. Powerful, layered and versatile tone with good attack. Especially good for slap and metal. An ideal beginner bass if you're wanting to try your hand at 5-string. The LX205B is also perfect for those who want a backup or a quick "pick me up" around the home. Many six-stringers have bought this Rogue to write and record their bass lines and been pleasantly surprised at how much more it would be capable of. A string change and setup is highly recommended to get the most out of this bass. It's crucial that you don't judge guitars this cheap too harshly straight out of the box, and the more experienced players know this. But because it's so cheap (a mere $160), any improvements to its factory state are made all the more affordable and, with a reasonably priced professional setup, you can still keep your total spend around the $200 mark, which is frankly amazing. The independent pickup volume and tone controls allow you to dial in a well balanced sound. It won't growl or punch like the active EQ basses on this page, but the pickups have decent volume, clarity and definition. With 24 frets, you'll have a good scale range to explore, with the deep cutaway providing good access to the higher frets. Overall, it has the feel of more expensive basses and hands down beats all other 5-strings under $200. 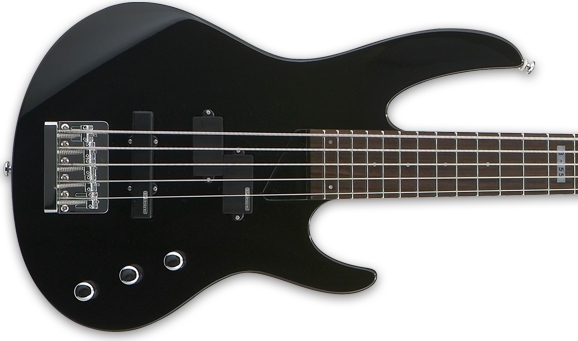 A budget bass modelled on Ibanez' classic Soundgear spec. Their entry level GSR series has given beginners a solid, ultra playable bass to learn on and pros a reliable workhorse for the small stage. As part of this series, they offer a cheap 5 string bass that fills the deepest of grooves. The 205 features three standard controls (2 independent volume, 1 shared tone) with the bonus of an active Phat II bass boost (you'll need a 9V battery to activate this). The Mahogany body gives you deeper, darker tones than the Rogue and the slim, fast neck typical of Ibanez basses offers exceptional comfort and playability. There are a few comments claiming the neck as the fastest they've played for a 5 string. So if you like to run across the neck, you'll feel in your element here. The GSR205 will handle more lively styles, such as funk beautifully, although it certainly has enough "chug" for downtuned metal. It's not quite as versatile as the ESP B-55 featured, but if you crave that deep and thick low-mid presence, it will deliver ten fold. The lowest string postively rumbles. With the tone pulled back, however, the neck humbucker reveals some softer, rounder jazz tones. The active boost generally thickens up the sound, adding a satisfying growl to the edges of the muscular punch that passive basses in this price range simply can't attain. The obvious thing to note here is that, because of the bottom heavy tone, you'll need an amp beefy enough to support rather than fight it. So it pretty much sounds like it's built - a tank. Users generally feel confident enough to gig and, in some tongue-in-cheek cases, defend their home with the GSR205. For anyone making the switch from 4 to 5 string for the first time, you won't be disappointed. A more traditional 5-string spec, with Fender's iconic Jazz Bass body and tone. Squier's Affinity series has given players on a tight budget the quality they need for both recording and live shows. Users have been impressed by the level of quality control coming out of Squier's Chinese factory. So there's a good chance you'll find it plays beautifully straight out of the box - one less thing to worry about. It's a simple bass, with 3 controls, passive electronics and just 20 frets. But anyone who knows about the Jazz Bass will appreciate how faithful the Affinity is to its more prestigious Fender counterparts. They'll also tell you that its weight - a few pounds heavier than the other featured 5-strings - is something you'll have to get used to, a reasonable price to pay for one of the most solidly constructed basses in its price range. In terms of tone, it delivers that classically smooth, mid-range JB roundness and warmth that good flat-wound strings will really complement. The alder body helps to provide a decent, woody punch and resonance, while the thin, C shape neck makes it easy to play. Overall, anyone who doubted Squier have had their expectations thoroughly exceeded with the Affinity JB, many even comparing it favourably to the Mexican Fender JB. A traditional sound for those clean, smooth, articulate bass lines. Closest, in terms of look and feel, to the Ibanez, but the B-55 is altogether a different animal and blows all others out of the water at this price point (sub-$300). The P and J style pickup configuration gives it tonal versatility, whereas the ultra slim neck (measuring just 43 mm at the nut) makes it comfortable even for players with small hands. On the back you'll find six neck-body bolts instead of the usual four - a sign of its solid construction. Extra jumbo frets help keep your playing smooth and quick across the neck and help with more technical playing such as bends. Like the GSR205, the B-55's active boost fattens and deepens the low-end and smooths out the mid-range. But what makes the B-55 different is the crisp overtones that gives those slap and picked bass lines a satisfying percussive attack - something the Ibanez glosses over slightly. This also gives it plenty of definition and power for metal. So while it takes care of the rumbling bottom end, it also has a bright P-bass-like "zing" to its attack. Overall, it's a more richly layered tone than the other basses featured here, meaning a broader tonal palette to shape to your liking. It's also no coincidence that the B-55 is the most expensive out of the four basses. But it's a good deal more bass for your money. The most versatile, well constructed 5-string you'll find for $300.